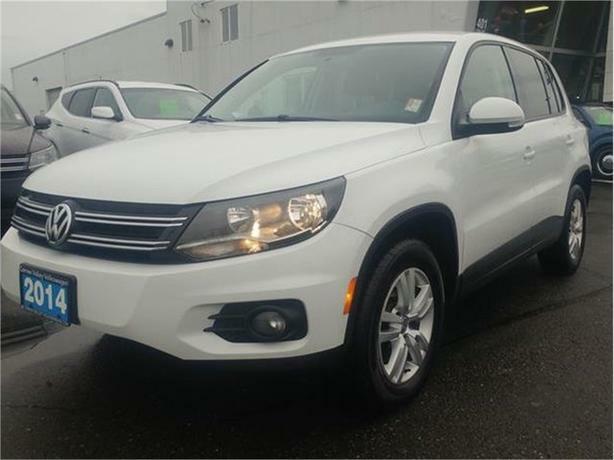 Check out this reliable 2014 Volkswagen Tiguan -. Window Grid And Roof Mount Diversity Antenna, Valet Function, Trip computer, Towing w/Trailer Sway Control, Tailgate/Rear Door Lock Included w/Power Door Locks. *This Volkswagen Tiguan Comes Equipped with These Options *Strut Front Suspension w/Coil Springs, Steel Spare Wheel, Single Stainless Steel Exhaust w/Chrome Tailpipe Finisher, Side Impact Beams, Side Curtain Protection Curtain 1st And 2nd Row Airbags, Rigid Cargo Cover, Remote Releases -Inc: Power Cargo Access, Remote Keyless Entry w/Integrated Key Transmitter, Illuminated Entry and Panic Button, Rear Cupholder, Rear Child Safety Locks. * Visit Us Today *For a must-own Volkswagen Tiguan come see us at Comox Valley Volkswagen, 401 RYAN RD, COURTENAY, BC V9N 3R5. Just minutes away!